Microsoft is working on the next feature update for Windows 10 called the Creators Update. The new version of Windows 10 will be made available in April 2017 according to latest projections, and it will introduce a series of new features and changes to the operating system. The built-in Share functionality of Windows 10 will be updated in the Creators Update as well. We talked about this when the first screenshots of the new user interface leaked. The core change is that the Share user interface will open up in the center of the screen instead of the sidebar. Update: We have published a detailed guide on disabling share suggestions. Along with the change come ads. 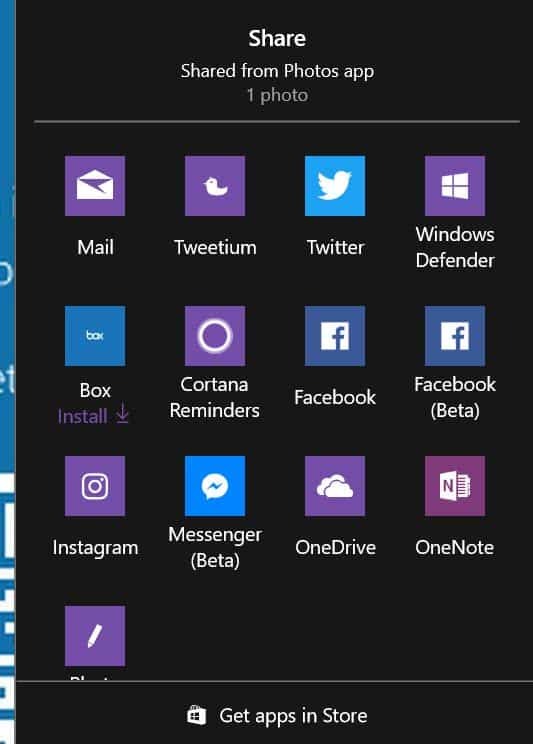 If you take a look at the following screenshot, courtesy of Twitter user Vitor Mikaelson (via Winaero), you see the Box application listed as one of the available share options even though it is not installed on the device (and never was according to Vitor). The suggested app is listed right in the middle of the share interface, and not at the bottom. Microsoft uses the Share UI to promote Windows Store applications. This is one of the ways for Microsoft to increase the visibility of the operating system's built-in Store. The Share UI is not the first, and likely not the last, location to receive ads on Windows 10. Ads are shown on Windows 10's lockscreen, and in the Windows 10 start menu for instance. While it is possible to disable the functionality, it is turned on by default. Ads in the Share UI will likely be powered by the same system which means that you will be able to turn these ads off in the Settings. Microsoft is not the only company that uses recommendations in their products to get users to install other products. I'm not fond of this as I don't like it that these suggestions take away space. While I don't use the Share UI at all, I do use the Start Menu. The recommendations there take away space from programs and applications that I have installed or am using. Yes, it is easy enough to turn these off, and that's what I did as I have no need for them. Should I ever run into a situation where I require functionality, say sharing to Box, I'd search for a solution and find it. I can see these recommendations being useful to inexperienced users however who may appreciate the recommendations. There is a debate going on currently whether to call these promotions advertisement, or recommendations / suggestions. Now You: What's your take on these? How do you call them? Microsoft plans to roll out the upcoming Windows 10 feature update Creators Update with a new Share UI, and will push ads in that UI. I can understand why MS does this, I really do. When the average Joe buys an off the shelf PC it already comes with bloat/adware, so MS is thinking a few more ads won’t hurt too much and the Store could really use a boost. But as a Windows user I just don’t like it. Having to remove ads from a “clean install” of Windows leaves a bad impression. I saw this coming a mile off. It’s free. How did people expect it would be monetised? It’s not free for everyone. XP and Vista users had/have to pay, and people who buy a new PC are paying for the Win 10 license, factored in to the cost of the PC. If you build a brand new PC, you have to pay $120 for it, same as before. There should not be ads, period. Free? I build custom computers. Windows 10 cost $79, if I can find it on sale at NewEgg. Otherwise, it costs $99 for Home. On new builds Windows 10 is anything but free. Seeing how the OED definition of “advertisement” is a notice or announcement in a public medium promoting a product, service, or event I’d say people calling these recommendations / suggestions are just arguing semantics. Back on topic whatever people want to call them really doesn’t matter, it’s Microsoft’s OS and they can do whatever they want regardless of what customers think or want. Which is why Windows 10 has been flat lining for the past three months. There’s a glaring contradiction in this sentence, which you might like to consider. There has been a strange tendency in society in the past years, of people saying : since money is involved, anything goes. Strangest is the fact that people spouting such nonsense are usually not at the top of the food chain. It’s not Nadella or Zuckerberg saying this, which would be obnoxious, but understandable. It’s the lowly, anonymous user of Corporate Inc.’s products trying to be clever, volunteering to become a slave, and berating others for daring to disagree. @Clairvaux, Yea you’ve lost me there, what you’ve said bears no relevance to what you quoted from me whatsoever, i made no mention of money, a food chain, Nadella, Zuckerberg, or lowly, anonymous user of Corporate Inc.’s products. Even if you can turn it off, if MS finds out that it has not enough return from those adds, and they link it to the fact that too many people have turned it of. They won’t make the logical conclusion that people don’t won’t this , but instead they will make it mandatory or worse if they find a way. This is just another reason why most people should not have installed w10. Stay on the hamster wheel, I’m sure they have lots more coming. Corporate users are shielded from all this advertising nonsense with a “special” Windows 10 edition which they pay for on a monthly & per user basis. I know if I was a CEO or management of some kind, I’d demand that there be no adverts & other store crap in a real business edition of the OS, otherwise I’d find something else to run our programs. And, for now until january 2020, Windows 7 rules the corporate world. Unfortunately, small businesses that run Win 10 Pro are not so much immune to the advertising crap; however, there are still ways to mitigate the onslaught. What a strange debate to have. If Microsoft gets money from making these “recommendations”, then they must be called ads. By money I mean any kind of retribution from the company that got its product recommended. It doesn’t have to be actual money, a deal of any kind means that Microsoft is advertising the company’s product. Otherwise, let’s start calling all behavioural advertising “recommendations”. Because obviously if the user is potentially interested, it cannot be advertising any more right ? If you want to know what an actual recommendation is, read Ghacks articles, it’s filled with software reviews made by Martin in exchange for nothing. What a piece of rubbish. And why do we need “share” function on desktop when we have Ctrl+C/V?? It makes sense on a phone due to their nature and lack of easy copy/paste, but on a desktop it’s just more bloatware. This is something that I’d expect from Google on their Android platform, but not from Micro$oft. Yes, I’m saying something positive about Google (urghh), that’s how ridiculous Winblows 10 became.. I still prefer desktop Windows. Like all mobile OS I know, Android gives you no control and it’s a massive chore to protect yourself from the entire universe spying on you. Windows 10 in spite of all the work that went into turning desktop to THAT, can still be tamed by users. For now. Android’s excuse is that I’m using it on an inferior device. Control or not, my point was the blatant ad in the sharing panel. I think it’s reasonable having high expectations from anything that I use on my desktop, and even higher when we talk about 1st party functionality of the OS. Using LTSB 2015 in a VM, I’m telling you, I don’t feel I have any control of it. Despite having updates, CEIP and all the nonsense disabled, having it in a somewhat usable condition. Leaving that VM minimised it still starts hogging CPU resources for no reason, even without internet access. Its task manager indicates high “disk” usage, but I have no idea what is it doing in that VM, I disabled everything while I could still have it usable (read: being able to boot). Bugs on top of other bugs – taskbar flickers whenever I do file operations, the pathetic excuse of a start menu that is, working only when it wants, with the only installed program beingFirefox Nightly – there’s no excuse for this. That’s bellow the lowest standards that could possibly be called standards..
Again, not defending Android, but I have zero expectations from it. None, modern mobile OSes are a disgrace and glorified spyware/adware, yet the sharing panel on my Nexus 4 does not recommend me applications I should use, the launcher does not tell me to use Chrome if I want “free games and movies”, it certainly doe not ask me to use their office cloud whatever they callit nowadays, and I definitely was never asked to rate how much I like the calculator applications. I’d expect this cr.p from Android (or iOS) but it doesn’t do it. I have high expectations from windows, and yet it under delivers..
As one of the people who refused to switch to Windows 10, I’m always happy to see yet another post that reminds me of why I made the right decision. For those who did make that switch: no doubt there’s more in Store for you! No need to pay for Linux OS n yet r not bombarded by ads = best deal in town. No need to pay Google for Android OS or ChromeOS, but got bombarded by ads = fair trade. Hv to pay M$ for the Windows 10 OS, n still got bombarded by ads. Nice to see after Microsoft deleting pre-installed bloatware (helping the customer enjoy a better Windows-ecosystem experience), Microsoft is now providing the bloatware itself (helping the customer enjoy a better Windows-ecosystem experience). It’s clear Microsoft is just helping the customer enjoy a better Windows-ecosystem experience. Enjoy, W10 customers! As Henk van Setten wrote: “For those who did make that switch (to W10), no doubt there’s more in Store for you!”. It’s remarkable how persistent Microsoft has become about that, but if I’m honest, I shouldn’t be. Ever since the company has stopped viewing their operating system as a product and has started pushing it as a service, this step was inevitable. Now the user is both customer and product in one – a step which I’m not at all happy about, since this isn’t some freely available service like Facebook but a piece of commercial software. More and more people will end up paying for it, even if it’s only indirectly by purchasing a new system with the included and cheap OEM license. Soon every W10 menu/screen will be like many websites; unstoppable ads blocking user actions. uBlock Origin as a UWP app ? Unfortunately it’s unlikely to be possible, because filtering network requests system wide is hard, especially nowadays with HTTPS becoming the default. Edge gets CSP level 2 only in April ? It’s a year and a half behind the other browsers. For something so important, I wonder why it wasn’t implemented since Edge’s release. If the “suggestion” is for something that costs money, it’s an ad. Ugh. Non-removable cruft in menus irritates me so much, even if it’s not specifically ad-related. I stopped using Chrome on my tablet after the Marshmallow update because the Chrome share menu suddenly included random Twitter contacts who I’ve never shared anything to, ever (at the top of the menu, but appearing a second or two after the rest of the menu, causing me to tap on the wrong thing) which can’t be removed, apparently.